Mr. Adarsh Vijay, intern at the ISSSP, NIAS presented his initial research findings on June 15, 2016 at the NIAS Wednesday Discussion Meeting. The Indian Ocean Region (IOR) has been witnessing dramatic shifts at the economic and strategic levels. Blue economy as conceived by Gunter Pauli is capable of delivering manifold benefits for India. Apart from the achievement of a healthy ocean with higher productivity, it has serious implications at the foreign policy level. Blue economy signifies a strategy for ocean exploitation by incorporating the principles of social inclusion, environment sustainability with innovative and dynamic business models. It embraces organic and renewable inputs as catalysts for the blue model. In short, it strives for greening the ocean economy. 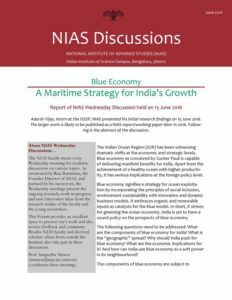 India is yet to have a sound policy on the prospects of blue economy.